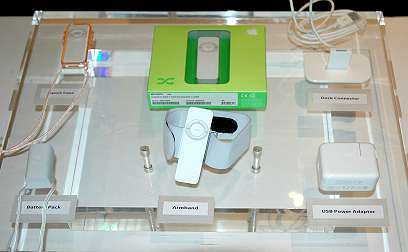 On Tuesday 25 January, Apple Thailand launched its latest products, initially released at at the Metropolis Hotel in Bangkok. There were no surprises following MacWorld in January, but It was good to see the real thing and hear first hand information from Apple executives. Pakpoom Setarath made a welcome speech (in Thai). He was also available later for questions. With Maccenter's Noppadol Lertussavavivat translating, Tony Li and Darren Sng introduced the new lines. Although rumoured for months, the actual appearance was a surprise: all that in such a small box: we thought the G5 iMac was compact. With more power than the G4 tower in my office, early reports suggest it performs well in all applications, such as Photoshop and 3D-modelling software. 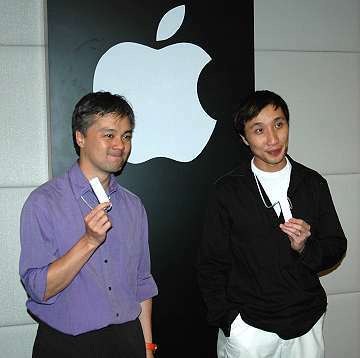 Tony Li outlined the target markets: current Mac users who would like a second system; PC users who are "disgruntled with the Windows environment"; iPod owners. As a standalone music managing machine -- one that can run both DVDs and music -- this is a good core for a home entertainment system. 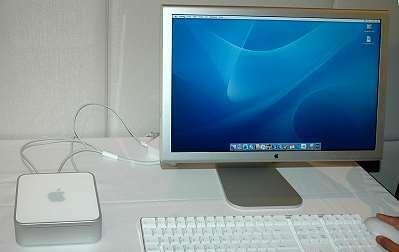 OSX, with its applications, including iLife (see below), has motivated many to move to the platform. With a non-diluted operating system, and enough software to run a small business, Macs are making more sense. At 6.5" x 6.5" x 2", the Mac mini could be easily concealed. Its anodised aluminium and white polycarbonate finish are easy on the eye. It has Firewire, USB and headphone ports, Ethernet, internal modem, video out (with an adapter a TV can be used) including VGA, and a security slot. There are two versions, the 1.25GHz with a 40GB disk, and the 1.42GHz (80GB). Prices are fair at 23,400 and 27,100 baht respectively. Both come with a combo drive (a superdrive is an option), 256MB of RAM. Upgrading should be done at an Apple "retailer." 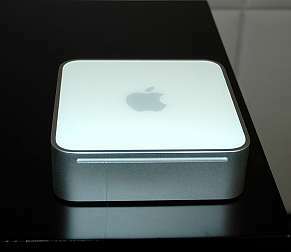 I anticipate getting my hands on a Mac mini soon for review. Darren Sng introduced the software, starting with iLife. iPhoto now includes the ability to handle RAW format from digital cameras (long missing), and also has more image manipulation tools. In addition, it now works with MPEGs, aiming at consumers whose cameras can record video clips. iMovie HD is beefed up considerably to handle High Definition cameras that companies, like Sony (with its HDR-FX1), are developing. Editing tools have been strengthened and now include "Magic iMovie" which imports, lays out and adds transitions (it will also burn to DVD with Superdrive). I thought this would remove some of the fun of learning, but the end product is what consumers want, not the fiddly bits. iDVD 5 has new themes and transitions of such quality that one might expect them in Hollywood products. We are going to see some of these in local movies and advertisements. With "one-step DVD" one click imports from the camera, and burns to DVD. GarageBand 2 has been enhanced, now recording up to eight tracks and one instrument simultaneously. New features, that brought approving murmurs, allow users to adjust out of tune vocals and instruments. It is possible to change a female voice to male (and vice versa), or to a "chipmunk" vocal. A valuable extra is the ability to produce notation: the notes are written as you make the music: this helps with learning and publishing. There are now four Jam Packs -- additional (royalty-free) loops -- the latest being "Symphony Orchestra". iLife (included on new consumer machines, including the Mac mini) is 4,900 baht. Each Jam Pack is 5,900. A new suite is iWorks: combining Keynote (v.2) and a new word processor, Pages: "a word processor with a sense of style". Keynote is the presentation software used by Steve Jobs, and me. It has new transitions and themes, as well as animated text and images. "Pages" is for brochures, reports, newsletters, as well as letters. Several templates are included. Dragging and dropping text or pictures, changes the template instantly. Like all "Cocoa" applications, Pages supports Thai use. There are several output types, including pdf and html. Darren also briefly introduced Final Cut Express for HDV, which falls between iMovie and the professional Final Cut Pro. 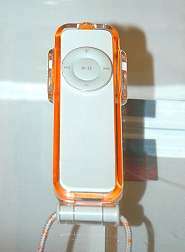 Tony Li demonstrated the iPod shuffle: a flash player. Apple made a conscious decision not to follow other flash players in the market, keeping to its minimalist philosophy. Many users of both iTunes and iPods use the random selector, so this became a feature of the latest device, cutting out the screen. When I explained this to a colleague, she said, "Why would anyone want a screen." If randomness is not require, users can select songs to play in order. Batteries last for 12 hours on a full charge. With USB charging, there is no need for AAA batteries (there is an accessory that uses non-rechargable batteries). iTunes controls the use of iPods and with the shuffle it features Autofill, which loads the correct number of songs for the capacity. There are two versions, a 512MB player (120 songs) for 4720 baht, and a 1GB player (240 songs) at 7,020 baht. Both come with headphones, a lanyard and software (for OSX or Windows). Several accessories - each priced at 2,190 baht -- were on show: armband, carrying case, charger. With over 10 million iPods sold, this is not a passing phenomenon. Note: I have also put up several more images of the Press Release.